With company growth, your infrastructure becomes more complex and costly, requiring solutions to simplify and unify the processes. Server virtualization addresses this issue by making IT more efficient and less complicated while allowing you to do more with less. Millions of servers are shipped and installed each year into businesses across the country. If these are physical servers, running a single application with its individual operating system, only 5-10% of the server resources are being utilized. Data centers are experiencing tremendous increases in hardware, facility, operational and maintenance costs. Small and medium sized businesses experience even greater challenges due to limited space, budget and personnel constraints. 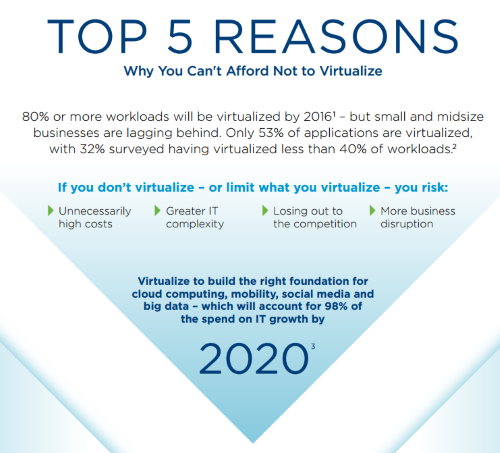 Server virtualization allows you to run applications on fewer physical servers. The Virtualization software, called a Hypervisor, allows each application and operating system to live in a separate container running side by side on a single physical server; each guest virtual server is fully isolated and fully encapsulated. Competing resources, like CPU’s, storage and networking are pooled together so each application gets what it needs for peak performance. This maximizes the server’s hardware resources so you don’t need nearly as many physical host servers. With server virtualization, all the servers you had in the physical environment now have a hardware layer and a virtualization layer. Running on top of these layers are your applications, each with their own separate operating system (like Windows, Linux, etc.). These applications run in isolation, just as they would in a physical environment. The kinds of consolidation ratios customers are seeing today range from 10:1 to 20:1. This means that customers running 80 servers in a physical environment can now consolidate that down to as low as 4-6 servers. As a result, your hardware and overhead requirements drop while application performance can improve, giving you greater value at a lower cost. On average customers are getting a return on investment in less than three to six months. Virtualization also makes supplying a new application much quicker and easier than ever before. Typically it would take weeks to make an application or service available for use. You had to procure the physical server, install the OS, patch it, and then configure the application. With virtualization, it takes only minutes to add to the virtualized server and deploy a new application. But not all Virtualization is created equal. At Stablenet, we recommend VMware which is far and away the most trusted and widely deployed Virtualization platform, worldwide. With VMware, IT Management is a lot simpler. Tasks that used to take all night can be done in one afternoon. Maintenance that had to wait, sometimes weeks, can now be done during business hours without any interruption. High availability and fault tolerance are built right into the platform. If a server ever fails, your apps stay up and running; with no downtime, no data loss and no need for human intervention. VMware also shields virtualized apps and data with unified easy-to-use security across all levels. Server virtualization fulfills your company’s growing requirements for availability, reliability, scalability, performance and security allowing you to spend more time on innovations to meet real business needs. Go with Stablenet, a trusted company with a reputable platform that delivers the greatest benefits, the largest savings and the highest responsiveness to your business. 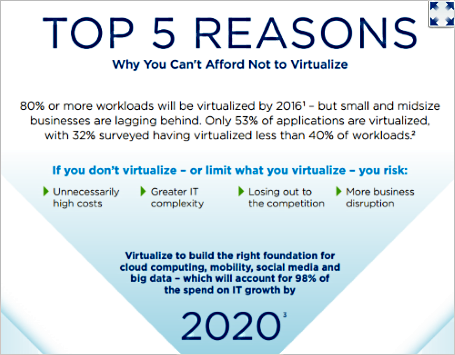 Why small and midsize businesses are the fastest growing segment in server virtualization. Storage Virtualization Brings Efficiency, Manageability and Flexibility to the Storage Environment. Learn how a Veeam solution can help businesses move from legacy backup to High availability (HA). Learn about VMware Virtualization, Cloud Infrastructure and Business Mobility. Stablenet engineers have undergone extensive training and met all competency requirements to establish Stablenet as a Dell Preferred Partner. Stablenet has completed comprehensive training for the Dell Storage specialization. The training increases the technical knowledge of storage products, and allows IT staff to perform custom storage assessments and provide integration services for our clients. Expert. Responsive. Local. Dell Certified. Contact us today. We can help optimize all aspects of your IT infrastructure with Virtualization.